Situational Leadership is a simple model of management that has been around for nearly 50 years. The simplicity of this model of management is one of the most popular things about it. This page is just a brief recap to remind and refamiliriarize anyone who has been exposed to Situational Leadership in the past with its general concepts. The core concept of Situational Leadership is that managers and supervisors should endeavor to match their leadership style to the development level of an employee for any given task or skill. There are two major versions of Situational Leadership, so some terms will have two words for a similar concept. This page will not delve into the differences between the two versions. 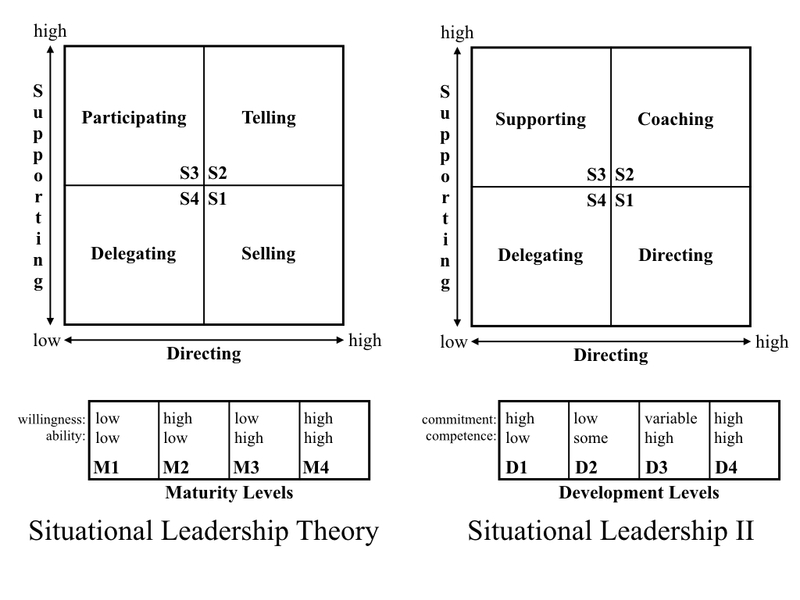 There is a bit more to Situational Leadership beyond the 4 Leadership Styles and 4 Developmental Levels, but this review will confine itself to describing this portion of the model. The graphic below illustrates the overall model and changes from the first to the second version. 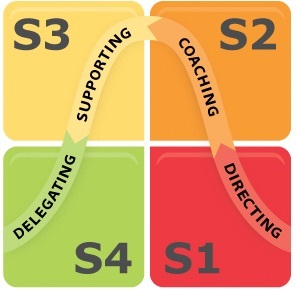 The descriptions below refer to the Situational Leadership II version. This style is high on directing and low on supporting behaviors. This style is paired with developmental level 1 so showing and educating the employee on how to complete the task at hand is the primary focus. This style continues to be high on directing but also becomes high on supporting behavior. This style pairs with developmental level 2 and is intended to counter the employee's reduced confidence with additional support. This style begins to reduce directive behavior as the employee in developmental level 3 has begun to master the skills needed for the task at hand while supportive managerial behavior remains high. This style is comprised of low support and low directive behavior and is essentially delegating to a competent and confident employee in a developmental level 4 category. The enthusiastic beginner is high on commitment but low on competence; excited to start a new job or task but unaware of how to perform. She or he needs direction on how to do her or his work. The disillusioned learner is beginning to lose commitment after discovering that the job or task is harder than anticipated. Some competence is building, but just a little. This learner still needs direction on how to do the job, but also requires more support to get through the challenge of learning the work. The reluctant contributor is beginning to gain significant competence and has variable commitment. Less direction is needed, but support is still required to help this contributor stabilize their commitment after struggling through the process of mastering the work. The peak performer is now high in both competence and now commitment as she or he has mastered the job or task and now needs little supervision. Situational Leadership has been around for nearly 50 years, but there's actually not all that much writing on it despite the decades of existence and use. The following are the references from my in-progress thesis on Situational Leadership. Most of them require access to some academic library database, but a few are just regular books. Blanchard, K., Zigarmi, P., & Zigarmi, D. (2013). Leadership and the one minute manager: Increasing effectiveness through situational leadership II. New York: William Morrow and imprint of HarperCollins. Goodson, J. R. (1989). Situational Leadership - A Test of Leadership Presciptions. Group & Organization Studies, 14(4), 446–461. Northouse, P. G. (2013). Leadership: Theory and practice (Sixth Edit). Thousand Oaks: Sage. Yeakey, G. W. (2002). Situational leadership. Military Review, 82(1), 72. Retrieved 01Mar10 from EBSCOHost.pdf. Military Review. Yukl, G. (2013). Leadership in organizations (Eighth Edi). Essex, England: Pearson Education Limited. © Jeff Hottinger. All rights reserved. Banner Photo by Hudson Hintze on Unsplash.